Restaurants taking part in the Seaweed Food Fair unveiled their dishes at the Onna Village Rapport Experience Learning Center on January 28. Onna Village is the birthplace of cultivating seaweeds such as sea grapes, mozuku and sea lettuces. In the village, the Seaweed Food Fair started on January 29. Twenty-three restaurants took part. The event continues until April 30. According to the Village Commerce and Industry Association, it is the first time the Seaweed Food Fair has been held in Okinawa. The previous day, at the Village Rapport Experience Learning Center, participating restaurants unveiled dishes that they will sell in the fair. Many people see seaweed as sashimi garnish. However, the chefs creatively used it to provide 39 colorful dishes such as Mediterranean pasta, Italian pizza, bowls of rice topped with sashimi, and hamburgers. 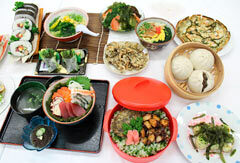 During the fair, the visitors enjoy the dishes priced from 250 to 1500 yen. The Village Fisheries Cooperative produces about 1,500 tons of mozuku, about 60 tons of sea lettuce and about 65 tons of sea grapes every year. The cooperative aims to increase demand for seaweed from Okinawa because many buyers of their products are outside of the prefecture.